5 Reasons Why You Should Eat LENTILS! Home > Blog > 5 Reasons Why You Should Eat LENTILS! Lentils are a “super food” that Project Open Hand includes in nutritious meals, which help our clients fight illness and cope with the challenges of aging. 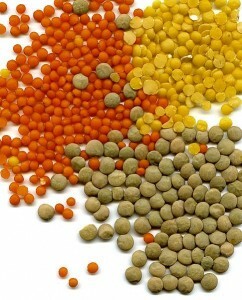 Lentils are rich in dietary fiber, both the soluble and the insoluble type. They are undigested, which means they will pass out of our bodies. Insoluble fiber encourages regular bowel movement and prevents constipation and helps prevent colon cancer. While soluble fiber reduces the risk of heart disease and regulates blood sugar for people with diabetes. Men need at least 30 to 38g of fiber each day. Women need at least 20 to 25g of fiber each day. And one cup of cooked lentils provides more than 15 grams of dietary fiber. Lentils contribute to heart health in their soluble fiber and in the significant amount of folate and magnesium. One cup of cooked lentils provides 90% of the recommended daily allowance for folic acid, which protects the artery walls and prevents heart disease. Magnesium lowers resistance and improves the flow of blood, oxygen and nutrients throughout the body. And studies show that a deficiency of magnesium is associated with heart attack. With 25% protein, Lentil is the vegetable with the highest level of protein other than soybeans. Protein is important to support normal growth and development. Lentils are a good source of important minerals like iron, magnesium, and zinc. Iron deficiency causes anemia while zinc is one of several nutrients necessary for fending off infections. Lentils also provide antioxidants such as Vitamin A and Vitamin C, which bind with and destroy free radicals, reducing oxidative damage to cells. Lentils also have a high content of tannins, phytochemicals that prevent cancer growth, making them a good addition to any diet. 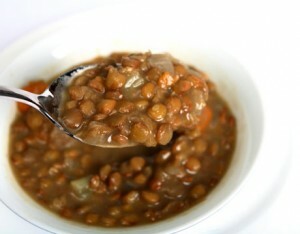 If you have kidney problems or gout, you may want to limit or avoid intake of purine-containing foods such as lentils. Since purines can be broken down to form uric acid, and excess accumulation of purines in the body can lead to excess accumulation of uric acid. Wash lentils, and drain well. Place the water in a large saucepan over high heat, and bring to a boil. Add the lentils, and stir once or twice. Turn off the heat, cover, and let sit for 30 minutes. Place the oil in a large pot over medium heat. Add the onion and celery, and sauté until softened, about 3 minutes. Add the lentils and water, and then add the remaining ingredients. Cover, and simmer about 1 hour. Serve hot. From: Positive Cooking by Lisa McMillan, Jill Jarvie and Janet Brauer. Put the lentils in a pot and fill with enough water to cover the beans by 2 inches. Bring to a boil, reduce to a simmer, and cook for 10 minutes, until not quite tender. Drain and set aside. Wipe out the pot, put in the broth and salt, and bring to a boil. Add the rice and lentils, and then reduce to a simmer. Cover and cook until all the liquid is absorbed, about 15 to 20 minutes. Remove from the heat and let rest 10 minutes. Stir in the parsley and serve (optional). VARIATION: To use brown rice follow the same directions, except cook for 35 to 40 minutes in step 2. From: 1,000 Lowfat Recipes by Terry Blonder Golson. Want more recipes and tips like this? Click here to sign up for our monthly eNewsletter. Every day, Project Open Hand provides 2,500 nutritious meals with love to seniors and critically ill neighbors. Donate now to help us continue to nourish our community.